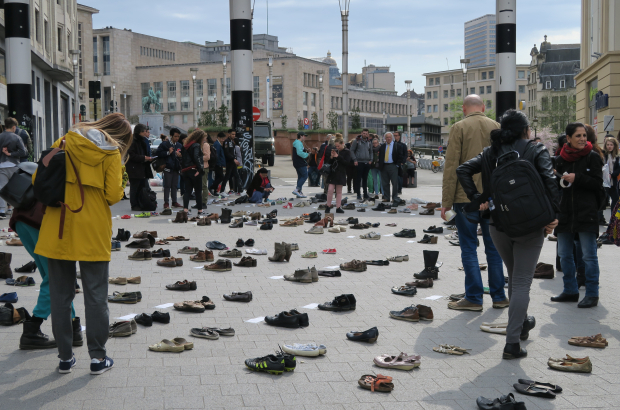 Four-hundred pairs of shoes were placed outside Brussels Central station on Wednesday afternoon to represent the civilian victims of Turkish air strikes on the Kurdish enclave of Afrin in north-west Syria. The shoes were accompanied by messages calling on Nato and the European Union to take action. Tens of thousands of people in Afrin province face limited access to food, drinking water and medical supplies after the Turkish army took control of the enclave on 18 March, driving out the People's Protection Units, a Syrian Kurdish militia, which Turkey considers a terrorist group. The Solidarity Afrin Platform, which organised the Brussels protest, said: "In order to show our support, we are asking the public to put pressure on Belgian politicians to stop supporting Turkey's attacks and to welcome refugees. "We urge people in Belgium to boycott Turkey as a tourist destination and to put pressure on NGOs and human rights organisations to get involved." On Tuesday, Turkey rejected a call by Russia to hand control of Afrin province to the Syrian government. Turkish president Recep Tayyip Erdogan said forces would only withdraw when it felt the time was right.